Classics 130 - The Trojan War: history or myth? Office Hours: T 9:30-11 and W 2-3:30pm or by appt. This course will explore the evidence for the Trojan War, one of the greatest stories ever told: literary, historical, visual and archaeological. The history of the search for the reality behind Homer's epic and its scholarship will be examined as well as detailed analyses of the theories currently in play. Through reading, visual analysis, discussion and writing - students will discover for themselves the ancient world of the heroes and their legends. 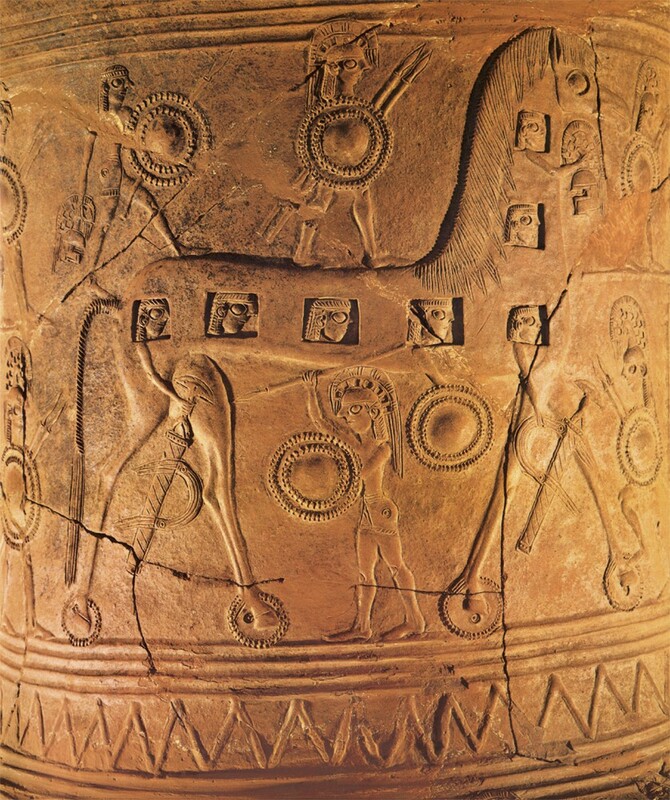 Was there ever an actual war between two powerful Bronze Age Aegean cultures? Did Hektor and Achilles ever really clash on the battlefield? Was Helen really "a face that launched 1000 ships?" The course-work will consist of illustrated lectures, extensive reading, and class discussion. There will be three writing assignments, each of a different style, all pertaining to aspects of the myth and its history, such as: research, comparative analysis, theoretical analysis/opinion, and critique/review. Information necessary for the completion of the writing assignments will be presented in class and especially through class discussion, so attendance and participation are vital. Grades will be based primarily on the writing assignments (75%) together with a grade for participation (25%), which includes brief class presentations. All papers (hard copies only accepted) must be turned in on their scheduled day in class. Other arrangements will be possible only for genuine emergencies and must be scheduled in advance. Deadlines that conflict with athletic or other academic obligations and religious holidays should be brought to my attention with written documentation at least 14 days in advance for other arrangements to be made. Written assignments will be graded as follows: (A++=100, A+=98, A=95, A-=93, A--/B++=90, B+=88, B=85, B-=83, B--/C++=80, etc.). To receive credit as a P/NP basis, you will need to complete all of the assignments and accomplish a final average of at least 70%. course; and you may be subject to judiciary action. To avoid academic dishonesty, be sure to appropriately cite someone else’s words, phrases, and ideas.